Stomach cramp is a nonspecific term which is usually used to refer to various symptoms as opposed to true stomach muscle cramps. People generally refer to any general pain in the stomach as a stomachache or as stomach cramps. Because of this, there is a large list of varied potential causes. Because stomach cramps and pain are actually a symptom of another complaint, the method of treatment will depend very much on the underlying cause. If you are in any way concerned, it is important that you seek medical advice. This will rule out any serious underlying cause. 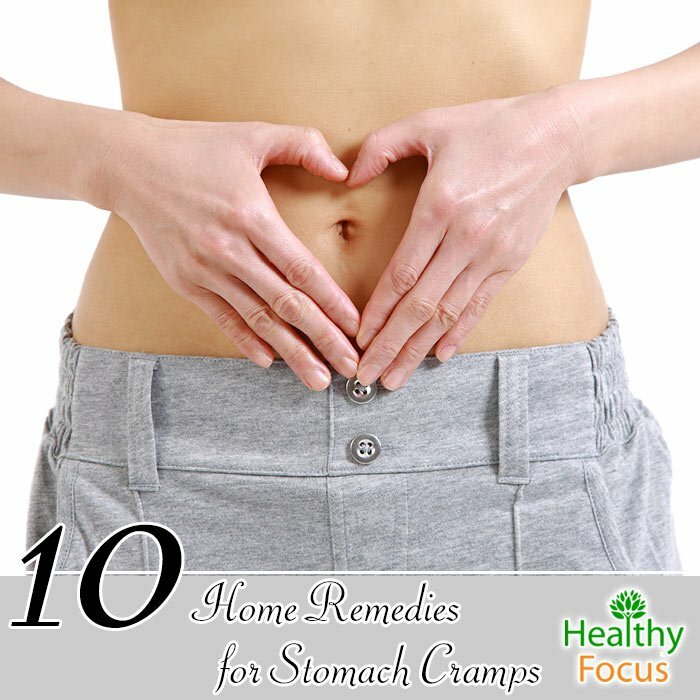 If however, your stomach cramps are not too severe, there are a number of effective home remedies that can help clear up your pain. Chamomile tea is well-known for its calming abilities on the mind and the body. It is also a great natural remedy for abdominal cramps and pain. Chamomile has anti-inflammatory properties that can help reduce inflammation in the stomach lining. It can also help to relax the stomach muscles which may be contracting too much causing you to experience cramps and spasms. You can either use ready made chamomile teabags or dried chamomile to make your tea. Both are absolutely delicious and unlikely to need any sort of sweetener to taste. Either use one teabag or 2 teaspoons of dried chamomile. Cover with boiled water then cover the mug and allow the tea to steep for up between 10 and 15 minutes. Sip slowly 3 or 4 times a day. Applying some warmth to your abdomen can help relax the muscles and ease your pain and cramps. You can use a hot pack or even apply a normal hot water bottle to your stomach whenever you feel that you need it. Make sure that your water bottle or hot pack is sufficiently warm by not uncomfortably hot. Reheat when it is too cool and use as often as you need. If you have never consumed rice water, it is basically the water which is left over after you have cooked rice. If you are experiencing a bout of stomach cramp, it is worth knowing that this water has some real value. Rice water has demulcent properties meaning that it can help relieve inflammation and provide a barrier over your stomach lining to help soothe your pain and discomfort. Cook up half a cup of plain white rice with about twice the water you would usually use. Once the rice is tender, remove the pot of the heat. Put the lid on your pot or pan and allow it to soak for between three and five minutes. Strain the liquid and drink it warm with a little honey to taste. Lemon water can help relieve stomach cramps and aches especially when your problem is caused by indigestion. Its natural acids help stimulate the levels of hydrochloric acid produced and this helps the body break down its food. Lemon water also helps to hydrate the body thoroughly keeping the digestive system ticking over more smoothly. Simply add the juice of a freshly squeezed lemon to a glass of warm water and drink down whenever necessary. Peppermint tea is another great herbal drink to ease an upset stomach while it can also help relieve any nausea that you may be feeling. Peppermint tea can help relax the muscles of your stomach while it may help to improve digestive health by improving bile flow. This makes it a great option of your symptoms are caused by bloating, gas or dyspepsia. You can use ready made peppermint teabags, dried or fresh peppermint to make your tea. Put 2 teaspoons of dried peppermint or a handful of the fresh variety in a mug. Add boiled water then cover the mug. Steep for around 10 minutes. Sip slowly several times each day or when needed. Chewing on some fresh peppermint leaves can also help relieve your stomach upset. Ginger root is a wonderful home remedy for a wide variety of ills. Ginger root contains medicinal compounds known as gingerols which can help to relax the stomach’s muscles and settle down any sort of mild upset. Not only that, but ginger is also well-know for easing nausea that may be accompanying your cramps. The best and most effective way to consume ginger root for a stomach ache or cramp is to take it in the form of a tea. Take an inch or so of fresh root then wash it and peel. Finely chop or grate the ginger. Bring a mug of water to the boil then add your ginger root. Boil for another 3 minutes and simmer for a couple more. Allow it to steep for a further 5 minutes. Strain and add honey then sip on it slowly several times each day or as and when you need it. If your stomach cramps and aches are the result of indigestion then chewing on some tasty fennel seeds can help you to recover very quickly. Fennel seeds contain a substance called anethole which is an essential oil that helps stimulate the digestive juices and boost digestive function. Fennel seeds also help to relieve inflammation and the pain associated with it. After your meal, simply chew on half a teaspoon or so of fennel seeds. Note that pregnant women should not use this remedy. Just like its cousin lemon, lime can help to ease a stomach upset and settle down your cramps. If you combine your lime with some regular club soda, it can help your symptoms a great deal. Club soda is especially helpful if you are suffering with indigestion or gas because it can help you to burp and relieve the gassy pressure in the stomach. Simply add the juice of half your fresh lime to 8 ounces or so of club soda and sip on it slowly. It may sound strange that an acidic drink like apple cider vinegar can help to relieve stomach pain. However, if your pain is being caused by gastric reflux, it can have a significant effect. Gastric reflux results in the stomach having less than the optimal levels of acid to properly digest your food. Apple cider vinegar can help rectify this imbalance. If you can tolerate the taste, you can simply swallow a tablespoon raw a few times each day. Alternatively, you can mix it up with a glass of water and some good quality honey to taste. Of your stomach pains are caused by constipation then there are few better remedies than some prune juice which has natural laxative properties. We hope that one of the natural remedies above is effective for you. As well as these remedies, try eating bland food that will not further disturb your stomach.